You've been running away from trying to learn basic HTML code because it just looks too complicated, but the reality is that these problems will appear over and over again. Soon you will find yourself running in circles – frustrated! So now is your chance - if you’ve always wanted to build webpages, but were intimidated by the code, this course will help you learn the basics so that you can survive and even thrive in the online world. In this particular video we are going to give you a quick overview of the video course itself. This way you know exactly what to expect. You'll also learn the basics of how HTML is structured, and by the end of this video you should fully understand why HTML is a lot easier to code, giving you the confidence you need to move forward. In this particular video we will be covering the best WYSIWYG Editor. The reason being is that before I teach you some basic HTML code, I want you to be able to know how to use these user-friendly editors. This will build your confidence, which you can take forward into learning basic code. I'm also going to show you a super easy trick to hack your way around without needing to know HTML. In this particular video you will learn the basic open and close tags. By understanding this concept and how HTML is structured, it will make more sense as you begin to dive in head-first. The first HTML code that we are going to start with is going to be heading, simply because you will be utilizing this within just about every single webpage that you edit or create. We'll talk about different sizes of headings and how to differentiate between them. Once you have gotten your feet wet with headings, it's time to move on to break tags. Break tags allow you to break up your lines. This comes in particularly handy when trying to add line space between images or even text. In fact, when I look back on editing basic HTML, I realize that this is one of the most widely used tags you can learn. Let's move on to basic text formatting, which consists of italicizing, bolding, underlining, aligning, and simply making your text look good. There are two main types of lists - ordered lists and unordered lists, a.k.a. bulleted lists. So, in this particular video I'm going to walk you through step-by-step as we begin to create these from scratch. By the end of this particular video you should be confident enough to create your list. Another widely used tag is the image tag. You can call an image at any location with that, be it on someone else's website or even your own. Checking an image is another very important HTML code because you are likely to run into it very frequently. You can also make your images search engine friendly by utilizing what we call alt tags. More on that in this particular video. Wait! That's Now All! Act Now & Receive The Following Bonuses Aboslutely FREE! Discover How To Create Good-Looking Professional Websites, Modify CSS Code, Speed-Up Loading Times, Plus So Much More! One of the major benefits of CSS (cascading style sheets) is the ability to manipulate the look and feel of a website without having to add extra heavy, slow-loading graphics. With CSS you can highlight text in a way that makes it stand out like a Photoshop title. You can add drop-shadows to boxes for a modern effect. You can use fonts that are not standard to everyone's PC. One of the major benefits of CSS is that you get to place all your styling coding into a separate file from your HTML code. This not only simplifies and cleans up your site structure but allows it to load quicker and makes life easier for you when you want to make quick edits - especially to your WordPress blog. You may not already know it but your blog may already be using several style sheets which controls the layout and structure of your site. So being able to modify it the way you want will not only give you more control but save you money from hiring someone to do the work for you. Today you get absorb all the basics of CSS in just over an hour to make you a better marketer. A value of $47 - yours FREE! Discover How To Display Your Customer's Name On A Page, Create Login Forms & Create Highly Responsive Pages Plus So Much More! Did you know that PHP plays a major role in the Internet's core foundation, with hundreds of new sites adopting PHP each day... like WordPress blogs! It's pretty clear to see that PHP skills will not become obsolete anytime soon. Should you ever want to pursue Web development further for more cost savings, a hobby, or a future career, PHP is a safe and sure bet. Take Your HTML, CSS & PHP Skills To The Next Level! These video lessons pack a serious punch. There's so much more than this; in fact, you'll be able to create a website all on your own. You'll wonder why you ever hired someone to do it for you in the first place. So, go ahead and grab these powerful videos now. HTML couldn't be easier, with each lesson being a small fraction of the cost of paying a developer to make changes to your website for you. In fact, these lessons pay for itself after just the first few edits you make! What could be better? YES Charles! 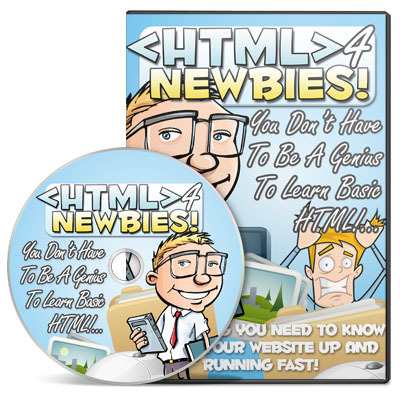 Give me instant access to HTML 4 Newbies! I want to design and control my websites the way I want without having to struggle with code!